A new hero has been born and Daniel seeks to divert the Dark and aid the Prophecy that promises great things and deeds from his nephew, the Child of Promise, who is becoming a powerful Enchanter even faster than his Uncle Daniel did. He is also able to be something that his uncle never was: a Rider of Dragons. He is even interacting, as the Prince of Panador, with the ever-expanding Circle of Light. Through the loss of friends and family he rallies to the call of the Circle that embraces him. But the Dark ways of Dajinn will test him to the fullness of the Promise he possesses – and beyond. Boncaster aids Daniel and the Circle to unite the Realms again. 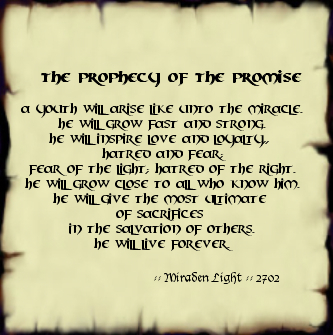 But through Dajinn’s Dark treachery the Child of Promise is called on to make the ultimate sacrifice. To come at a time of greatest need, this Child Of Promise, has been born and begins to grow. A favored child in every way, as most promised children are, he is nurtured by loving royal parents, grandparents and a peculiarly powerful uncle, Daniel Gregoryson — the Miracle of Mirador. The Child of Promise and The Prophecy (Daniel) continue to learn and grow and fulfill their individual prophetic lives in ways that are surprisingly linked together. Darkness is still alive. It seems impossible to just snuff it out. Soon, a new threat to the Realms of the Crystal Orb arises; a threat also to the Prophecy, and to the Child of Promise. What sacrifice will be required at their hands to usher in yet another victory? Is victory even possible? Story basis — Demon in a Bottle (Arabian Nights)???? ?